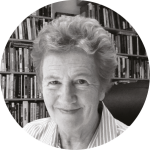 Paul McGuire Lecturer in Comparative Politics at Harvard University, Professor of Government and International Relations at Sydney University, and founding Director of the Electoral Integrity Project. One of the most remarkable developments in recent elections has been the propensity for younger citizens to vote, and support older socialist leaders advocating policies last fashionable during the 1970s. The British Labour party was pleasantly surprised to find young people flocked to Jeremy Corbyn’s rallies, a 68-year stalwart who never held office since entering parliament in 1983. A lifetime protestor, pacifist and antiwar campaigner, his Labour manifesto promised to nationalize key industries, scrap tuition fees, boost workers’ rights, raise taxes on the wealthy and negotiate a soft EU exit. The British Election Study (BES) shows 1970-2010 Conservatives consistently held a modest advantage among pensioners. But the age gap recently expanded and the June 2016 Brexit referendum saw a generational chasm. Younger people were significantly less likely to vote but when they did, around two-thirds voted Remain, by contrast 57% of pensioners voted Leave. 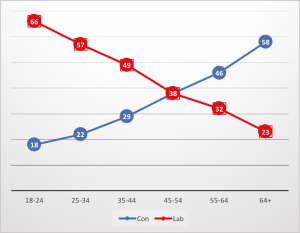 Similar divisions persisted in 2017 , according to the Ashcroft General Election day poll, Labour received the votes of 23% of pensioners but 67% of 18-24 year olds. By contrast, 59% of pensioners voted Conservative, but only 18% of 18-24 year olds. According to Sky News, turnout among 18-24-year-olds was 66.4%, up 43 per cent from 2015, especially in seats with many aged 18-29, possibly due to the high levels of the college educated populations in these constituencies. Class cleavages are negligible, although education was important; even controlling for age, the higher the share of college-educated, the larger the Con>Lab swing of the vote. Similar patterns, for a similar candidate to Corbyn, were witnessed during the 2016-7 US Democrat primaries. 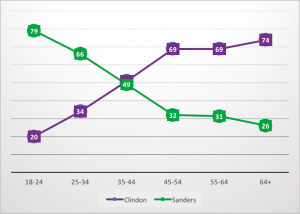 Bernie Sanders’ substantial lead over Clinton among younger voters was one of the hall marks of the contest (Figure 2).The generation gap was also evident in the Clinton-Trump vote (Figure 3); the 2016 American National Election Study showed if those under 55 had voted, Hillary Clinton would be president. 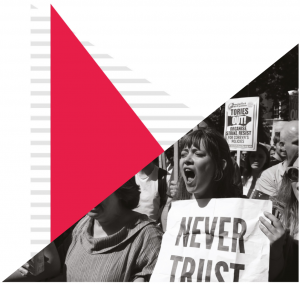 Youth were least likely to vote, though education was significant, occupational class inequalities, the underlying issue of both Sanders and Corbyn’s campaigns, failed to predict voting in either contest. So what explains these substantial age gaps? 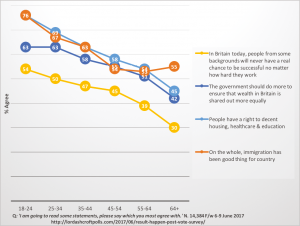 One explanation is that younger people are more idealistic and left-wing, attracted by the radical egalitarian economic message of both leaders; plausible if younger generations feel they face more limited economic opportunities than their parents and grandparents. Yet the evidence remains mixed. One study reported those who came of age under Thatcher were more rightwing towards wealth redistribution and the welfare state for example. Alternatively, youth voters may be attracted more by social liberalism (such as gender equality, globalization, and climate change) and antipathetic towards the authoritarian values associated with nationalism and immigration underpinning the campaigns of Theresa May and Donald Trump. In this view, Left-Right divisions may have made way for cultural cleavages around values of transactional national interests versus global cosmopolitan cooperation There is considerable evidence for this claim, for example, a Pew study noted growing ideological and partisan generational gaps,,American youth are more tolerant, engaged and supportive of social justice. Equally a World Values Survey shows persistent generation gaps along authoritarian and libertarian perspectives. An election day poll of 14,384 respondents, with CATI and online fieldwork 6-9th June does not show distinctive generational experiences (i.e. Boomers vs Millennials), life cycle effects (where attitudes change with age), or period effects (arising from specific events, like the financial crash). 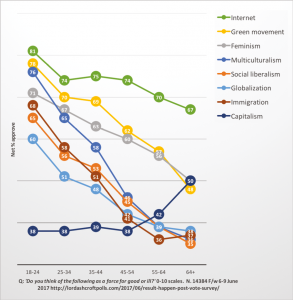 Figure 4 shows UK youth are far more liberal than their parents and grandparents who are more socially conservative on the Internet, the green movement, feminism, multiculturalism, globalization and immigration. The age gaps are substantial, for example a 30-point age gap between the youngest and oldest in approval of the green movement reflecting broader comparative evidence about the growth of libertarian and post-materialist values in many post-industrial societies. 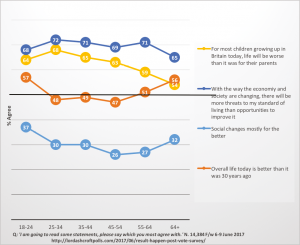 Comparing public opinion on economic issues shows similar age gaps (Figure 5); with young people exhibiting more leftwing attitudes suggesting they were more likely to be attracted towards Labour’s platform. Yet austerity seems to have minimal impact. Figure 6 shows less consistent age gaps on expectations of life chances in 30 years, whether social change was for the better or worse, and opportunities for advancement and social mobility. 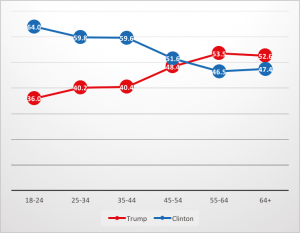 The striking age gap similarities evident in recent US and UK elections, and the closure of occupational class cleavages, raise important questions about the changing nature of party competition. If these represent generational shifts, and if young people can be mobilized to vote, then this could transform the policy agenda, future of party competition, and offer prospects for long-term electoral change.